This second edition is completely revised and expanded, featuring extensive discussion of bioenhancement technology, e.g., Platelet Rich Plasma (PRP), ACell Matristem Micromatrix, liposomal ATP, etc. In addition, entirely new information on medical therapy is discussed in Chapter 1, including updates on finasteride, prostaglandins, female therapies, Low-Level Laser Therapy, etc. Operative technique in Chapter 2 is completely revised, and new case studies are presented in Chapter 4. Chapter 5 is a new chapter that teaches students how to perform stepwise hairline design on human models and recipient-site creation on a melon. Videos have also been thoroughly revised and expanded. 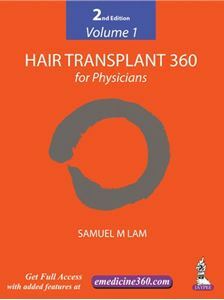 This book helps in understanding when it is safe and beneficial to operate and when to forgo the procedure (medical hair loss conditions, the dilemma of the young patient, scarring alopecia, etc. ), Male and Female Pattern Baldness, Medical Management of Hair Loss. It explains the hairline design (principles, artistic, ethnic, and gender variations; step-by-step technique), donor harvesting (graft calculation, determining area for harvest, understanding and using different harvest techniques, when to perform a trichophytic closure; step-by-step technique), recipient-site creation (basic principles: angles and distribution; regional considerations: male and female hairline, central forelock, midscalp, temple, lateral hump, and crown; step-by-step technique). Also postoperative care, identifying and managing complications, creating standardized hair-transplant photography, leadership, office management, and marketing have been explained brilliantly. The case studies emphasize creative approach to hair restoration. 7 full-length videos cover every major aspect of hair surgery including hairline design, regenerative medicine preparation and execution, donor harvesting and closure, recipient-site creation (both sagittal and coronal methods), crown design, graft calculation and planning, and recipient-site practice on a melon model. Chapters 2 and 5 contain video(s).